To make the dough, add the lukewarm water to a large bowl, along with the sugar. Sprinkle the yeast over top and wait until it dissolves. Pour in the olive oil, sprinkle in about half of the semolina flour and half of the bread flour and stir to combine. Then add the remaining flours and the salt. Stir a few times to combine the ingredients. Use your hands to bring the dough together and then turn it out onto the counter. Knead the dough for about 5 to 7 minutes, or until it feels and looks smooth. Portion the dough and form each portion into a round. Lightly coat each round with oil and place onto a tray. Cover lightly with plastic wrap and let the dough rise at room temperature until it doubles in size (about 1 hour). Note: This can also be done overnight in the refrigerator. By letting the dough slowly rise in the refrigerator, the dough will develop more flavor. To do this, place the dough into a very lightly-oiled bowl and cover tightly with plastic wrap. Let rise in the refrigerator overnight. Remove the dough from the refrigerator about 2 hours prior to making pizza so the dough can come to room temperature. Once you take the dough out of the refrigerator, punch it down, portion and shape it into rounds as described above. Cover and let the dough rest until it comes to room temperature. Place the pizza stone into a cold oven then preheat the oven to 450º degrees Fahrenheit. Let the stone heat for at least 30 minutes before baking your first pizza. Note: You can also bake the pizzas on the barbecue. Place the stone onto the grates and preheat your barbecue to the highest setting. Let the stone heat for about 15 minutes or so before baking your first pizza. Place a piece of room temperature dough onto a lightly-floured counter. Press it into a flat round. Continue to press and turn the dough while stretching it. You can also hold the dough upright, rolling it between your fingers as you stretch it. The weight of the dough will help to stretch it. You can also roll out the dough using a rolling pin. Sprinkle the peel with cornmeal. 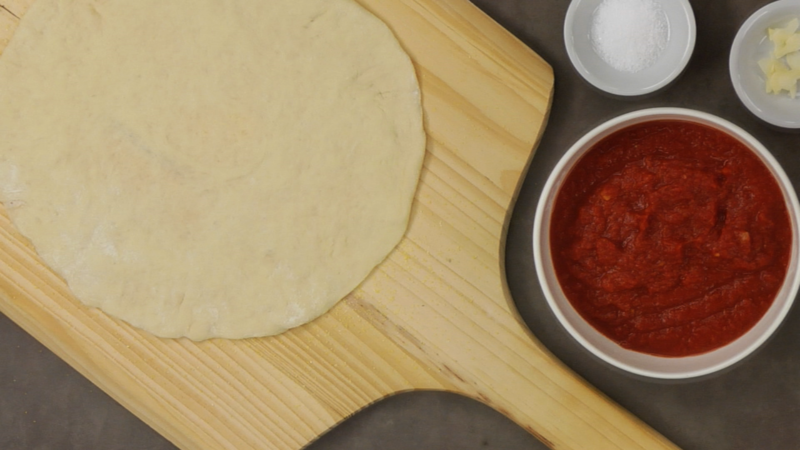 Gently transfer the dough to the peel and proceed with your pizza recipe. The perfect pizza dough is definitely a matter of opinion. We aren’t Italian, but this dough works for us. One thing we can guarantee is that preparing food from scratch for your family will always be better. Whenever making dough or pastry, it’s best to weigh the ingredients for optimal results. Being precise in your measurements will ensure consistency and success. It is possible to use active dry yeast in this recipe, just let it dissolve before continuing on with the recipe. Technically the “instant dry yeast” we used did not have to be dissolved first in the water. It could have been added directly to the flour, but it is okay to dissolve it as well. However, “active dry yeast” does need to be dissolved first in lukewarm water. This dough is enough for 6 to 8 smaller pizzas (approx. 6” to 8” thin crust pizzas). If you freeze the pizza dough, just let it thaw overnight in the refrigerator. Whether you freeze the dough or just refrigerate it, let it come to room temperature before you try to shape it. Refrain from washing your pizza stone with soap. Gently scrape off any baked on ingredients and lightly scrub with hot water. How would one use fresh yeast in this recipe? That's what I normally use for pizza dough, but without sugar. When a recipe calls for dry yeast, you'll need to double the amount when substituting fresh yeast. For this recipe, you'll need 20 grams of fresh yeast (I would use a scale for measuring fresh yeast). You don't have to use the sugar, but this amount doesn't hurt the recipe. Just break up the fresh yeast a bit and mix all of the ingredients together as the video shows. You'll work it into the dough when mixing and kneading it. Is there any way you can replace the Semolina and Bread flour with just regular flour? No problem, Vanessa. All purpose flour works just fine...the crust won't be as crispy, but as long as its thin, will work well. You can add a bit of whole wheat flour, or even cornmeal for that crispy texture...or simply bake a little longer. Is it possible to use active dry yeast instead of the instant dry yeast used in this recipe? Thats all I have on hand right now. It is possible to use active dry yeast...just let it dissolve before continuing on with the recipe. Technically the "instant dry yeast" we used did not have to be dissolved first in the water. It could have been added directly to the flour. However, "active dry yeast" does need to be dissolved first in lukewarm water. Good Luck! Wish I was having this right now! I made this recipe tonight and it turned out wonderful and delicious! Thanks so much. Hi Mike, 1. The environment can affect flour and baking considerably. This is why it is best to weigh your ingredients to obtain consistent results. One day there may be more or less moisture in your flour than the next. If you don't have a scale though, it’s no problem. Just be careful as to how much flour you add to the dough when kneading - just add a bit at a time until you get the right consistency. Many people think that dough shouldn't be sticky at all. I learned in pastry school that a "sticky dough is a happy dough" and it's true. Even though it may feel wet as you initially knead it, it will actually start to come together with time (unless, of course, it is extremely wet). 2. The text recipe has been updated to say "stir" after a portion of both flours are added. Hope this makes it clearer for our users. Thanks for that. 3. You can use a stand mixer to mix and knead the dough, but make sure it is a powerful one and keep your eye on it. The motor can easily burn out on a stand mixer with low wattage, so be careful. Besides, the best way to learn about dough is by touching it. This is the only way were allowed to make dough in pastry school. Everything was done by hand and for good reason. To really learn about dough, you need to understand how it should look and feel. By practicing a few times the good old fashioned way will help you know what to look for when you move on to a stand mixer. One more thing, when using a stand mixer, make sure to set it at a speed that will match your hand-kneading speed. Even though the machine will do the work for you, it should be done at the same rate. Don’t rush it. Hope this helps! I heard that the best way to know when the dough is kneaded enough is to use the window something test , you take a small piece of the dough and stretch it is if you were making a small pizza if you were able to make it very thin in a way that you can see your fingers behind it then it's ready. Is this a good method or would you actually over kneed the dought ? The window test tells you when plenty of gluten has been developed. However, pizza dough usually has olive oil in it, which inhibits proper gluten development. As long as the dough feels very smooth and has good stretching ability, the window test may be an overkill. The window test is more essential for breads made without any fat in it. I am about to invest in my first pizza stone and am wondering if there are any "favourites" out there? Secondly, can you tell me a good place in North, West or DT Vancouver to pick one up? Cheers! I have had 3 pizza stones in the last year. Something about the high heat and the fact that I forget to soak it all of the time, makes them crack. I have now switched to a perforated aluminum pizza tray instead. They are only about $15 dollars and it will last forever (well almost). That being said, I did like my pizza stones, so I guess as long as you soak them and then preheat them in the oven you should be okay. You can find them at most kitchen stores. I have bought them at linen n' things, the bay, and local kitchen stores. Hope this helps! I will let you know how the perforated tray goes the next time I make pizza. Hi, I would like to know if the amount of water and sugar use for this recipe change at all if you use instant dry yeast instead of active dry yeast. And when using active dry yeast, is it correct to take the water to dissolve the yeast from the 1 1/4 cups lukewarm water needed for this recipe or do I need to use the complete amount of water mentioned in the recipe, plus the water I need to disolve the yeast? Just wanting to know if I'm accurate :), thanks! Active or instant can be used - the water and sugar would be the same for both. If using active just let it dissolve first in the water. And if I am understanding your question - you do just need to use the amount of water in the recipe to dissolve the yeast (no additional water should be used just for dissolving the yeast). Does that make sense? Hope this helps! Funny I just made this the other day. We had a delicious pizza yesterday for lunch. I used half regular mozzarella and half smoked and topped it with a bit of spicy salami...yum! Why do you use cornmeal on the peel rather than semolina? Either one will do, but cornmeal is likely easier to find for most people. If using semolina, just make sure that it is coarse type. The coarse bits act like little ball-bearings on the peel and prevent the dough from sticking. I'm big on my time-saving efficiencies and would like to make some dough to use, and some to freeze for later. Where in the process should I stop with the dough I'm going to freeze; Do I let it rise, then freeze it, or freeze it without letting it rise? Do I need to let it re-rise after refrigeration? Good question...you should freeze it before it rises. After you knead the dough, divide it up and then store it in individual freezer bags. Then when you want pizza, remove it from the freezer the night before and let it rise in the refrigerator. Then about an hour before you make the pizza, take the dough out and let it come to room temperature...making it easier to roll out. Happy Pizza Making! It's actually the resting period in the freezer that relaxes the dough's gluten for easier rolling. Perhaps the freezing itself does the same. When it comes to the question of texture, that may be a matter of opinion. In either case, pizza dough does freeze quite well, and always good to have a few freeze-well ingredients or preparaions at hand. 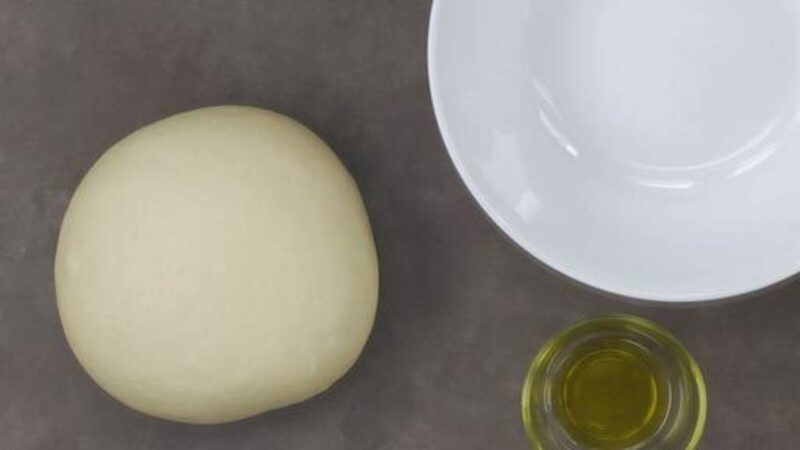 Making pizza dough with whey or milk produces a dough with a different texture (softer) and one that browns faster (because of the milk solids). Again, this is also a matter of taste. Will using a Kitchen Aid stand mixer and dough hook produce the same quality dough as hand neading it? You can use the mixer to start the dough (until it comes together), but you will likely need to knead it a bit more by hand. if I only use bread flour do I use the same measuremnets as using flour and semolina flour? Yes, for the best accuracy, weigh the bread flour (use 500 grams total)...or measure about 4 cups. Happy cooking! We tried making dough last night for tonight's dinner. When I took it out of the fridge 24 hours later, it had risen but there were areas that were bright white in color and the dough had a slight beer-like smell. Did we hold the dough for too long in the fridge? Is this dough unsafe for consumption? It should be fine to eat Aaron, no worries...the beer smell is from the yeast. In fact yeast is part of the process when making beer. Cheers! I could not find semolina in our local Sobey's - in fact, I have never heard of semolina flour - on your video it look like corn flour? I made the dough with Robin Hood flour for bread. The pizza dough came out just fine and we bought a pizza stone to make the pizza - the results were quite delicious - I loved the thin crisp crust. I followed the recipe exactly (using volume measurements though) and the dough came out very brittle; it has NO elasticity at all, if I try to stretch it it breaks. What could be wrong? I used bread flour (graded 650, I don't know if that makes sense to you as I'm not in the US, but it's the flour I use very succesfully for no-knead bread). Thanks. Me again. I've researched this a bit and it seems that there are two different things out there: semolina and semolina flour. In italian, they are called "farina din grano duro" or "semola di grano duro" for the flour and semolino, for the other thing. I am pretty sure I used semolina and this is why it came out so brittle. Also, in more than one hour it didn't rise AT ALL. Can you maybe clarify the difference between the two, if ther is one? Thanks. All bread flour can be used in this recipe with great results (I often do this without using any semolina). The bread flour you used has a high protein content, which is fine. The semolina provides a different texture to the dough. Perhaps your flour is very dry or too much might have been packed into your measuring cups. I would also test your yeast to see if it is active - sounds funny that you wouldn't get any rise. The next time you try this (if you don't have a scale) add only half to three-quarters the amount of flour to the water mixture and bring the dough together. If you are not weighing ingredients, don't feel obligated to use ALL of the flour. Commit to the liquid ingredients, yeast, sugar and salt. Then just keep adding flour until you get a soft (but still a tiny bit tacky) dough and you should be fine. I just found a link that has good information about Italian Flours. Don't be afraid to try it again. Hope this helps! When I couldn't find Semonlina, I used Robin Hood best for bread flour - Homestyle White. Since I live in Ontario, all our flour is Canadian and probably comes from Durham or hard wheat. I usually use All Purpose Flour but wanted the pizza dough to come out, so bough the Bread flour - it came out fine. If anyone lives near Ann Arbor, MI...Zingerman's Bake Shop sells semolina flour. Also, check with any restaurant that makes their own pasta or an Italian bakery. They should be willing to sell you a pound or two...or at least tell you where they purchase it. Kimberly, thanks a lot for the answer. I reached the same conclusion as you: the yeast must have been quite old. It took the dough half a day to even smell like dough, and no rise at all! It was indeed 2 years past its expiration date... I had bought a lot of yeast two years ago when I started to bake no-knead bread. I guess I have to make a trip to the store and get a kitchen scale while I'm there; it was on the list anyway. Regarding semolina vs. semolina flour, I'm pretty sure I used semolina, which is just a flour with a coarser ground after all, but I don't think that would have been a problem if the yeast was good. I'm happy to report that the yeast was not totally dead though ; I made pan-fried indian breads from this dough, to serve with the almond-coriander chicken curry (loved the recipe!) and they were excellent, (brushed with a little ghee)! Thanks a lot for the great videos and a great website. I am already learning a lot. I can't wait for more stuff on baking as this where I am the weakest. Good to hear you found out what the culprit was. Sounds like a good idea to stock up on some new yeast (try to buy small amounts if you don't use it that often). You won't regret buying a kitchen scale either...it will help with many baking recipes down the road. Cheers! Store your yeast in the refrigerator or freezer. Thing is that I've been using it all this time with good results; I baked a no-knead bread just a couple of weeks ago and it was fine; probably the long fermentation time made up for the weak yeast. I came to this "belief" that yeast actually never expires ;) which is obviously wrong. I will definitely buy a scale too, I think it is one of this things that takes you to the next level. It is fine to proof the yeast for 10 minutes or so - this is very good to do if you are using active dry yeast. Great to hear that you are getting excellent results! I actually love making this pizza on the barbeque with a pizza stone. I get far better results with the crust. I place the cold stone onto the cold grates, close the top and slowly let it heat up. The temperature gets nice and hot (hotter than a regular oven) and the pizzas cook in about 4 minutes - they are fantastic! Happy cooking! If you have scaled properly, the dough shouldn't be extremely wet. It is ok to use flour to SHAPE the dough, just don't work a lot of it INTO the dough. Was the dough difficult to knead? Or was it overly warm? When I first learned about doughs in pastry school, we were continually reminded that "a sticky dough is a happy dough". Don't be tempted to add too much flour, as this will just create a dry and dense dough. Some doughs are just stickier than others. I would stick with the formula and try it again. The most important thing is that you enjoyed how the pizza baked up. Cheers! So I get to combine my two favourite things - cooking and reading! In John Irving's latest novel - Last Night in Twisted River - his fictional cook is famous for his pizza - Dominic adds honey to the recipe and he also lets the dough double rise. If I wanted to try this, would I substitute the honey for the sugar? or add it in addition to? Does double rising make a better dough? Also the recipe specifies sea salt - is it really better? Great novel by the way - lots of great Italian recipes described in the novel! To answer your questions - The honey would be added instead of the sugar. Sugar or honey are often added to doughs, as yeast feeds (and loves) the sugar. The double rise (or double conditioning) is likely a good step (not sure of the recipe, but here are a few reasons they might do it). During the fermentation process or the double rise, the yeast releases carbon dioxide, enzymes, alcohol and acids. Theses enzymes strengthens the protein (or gluten), which gives the dough more stability during final rise (or proof). These enzymes also help to mellow out the dough which can make it more pliable (making it a bit easier to shape). The extra rise can also have a softening effect on the dough, Which can make for a softer dough once baked. Another reason why the double rise might be used is because it might give the dough more time to rise and the longer rise the more flavor will be developed. I say give it a try and let us know how it turned out Yes, sea salt is better than table salt. For more on salts watch the lesson on How to Season with Salt, Topic 2 talks about types of salt. Thanks for the tip on the novel, I am always a fan of books that somehow incorporate food into them. It has also been years since I read a John Irving novel. Thanks for the recommendation! Hi Amanda, Just a few more comments. Once the dough has been kneaded, it just needs to rest (covered) in a bowl until it doubles in size. Depending on the temperature, this could take anywhere from 30mins to quite a few hours (especially if the dough is in the fridge). The colder the temperature, the slower the rise...but you don't want the temperature to be too much warmer than room temperature. Next time, if proofing the dough at room temperature, don't go by time...just look at the dough to see that it has doubled in volume. Also, it may have been the type of flour you used. I know you indicated that you used bread flour...is this bleached or unbleached? We much prefer unbleached over bleached (and make sure it has a protein content of at least 12%). Even though you scaled the ingredients, some bleached flours will make the dough wet. Make sure you are not using bread flour designed for bread machines. We will be releasing a couple of dough/bread making lessons in the near future. Hopefully the information in there will also help you to troubleshoot. Happy baking! it is possible to put eggs in to the dough? ?for me this has no logic,,,,,,,,,,,what do you think?? Perhaps you could for more richness, but I do not think it is necessary. This dough is nice and simple. You could try it for yourself and see if you like the results. Cheers! Hey all! I made a simple pepperoni and cheese pizza using this dough recipe- it was superb. Spicy pepperoni, mozzarella cheese, oregano, basil, tomato sauce, little olive oil- yum! I have tried some really great pizzas out there but this was a treat. The dough was very, very sticky at first when I began kneading, and after it had rested overnight, but it still cooperated with a bit of extra flour and more kneading/beating with a rolling pin. This is the first time I've ever used sea salt, handled fresh dough, and baked a pizza made from scratch like this. I learned a lot, and realized that working with dough isn't as difficult as I thought it would be. I'm definitely going to be doing it again- and soon! Thanks so much for the recipe and lessons! If I am understanding your question, I just think you are not using enough semolina or cornmeal on the peel (wooden plank). Sprinkle it liberally. Don't transfer the dough to the peel until you are ready to assemble the pizza. The longer the dough sits on the peel, the more likely it will stick. As soon as you have assembled the pizza, transfer it to the baking tray or stone. Hope this helps. Cheers! Become good at shaping pizza dough really just comes down to practice. The more you practice the better you will get. Also, if you don't like the sweet taste of the semolina you could try cornmeal or flour instead. Cheers! Rouxbe, I've tried this a few times, and I don't feel good about the kneading. I just can't get it smooth. I do what I think looks like the video, but it's almost like certain parts knead better than others, and that I get a stretchy outside and a gooey inside. Also, I feel like it separates and when I do fold it over itself and roll it out that I'm creating layers (2 or 3) until it starts to split. I could use any clues here. Thanks. I used to use the cornmeal, but I have found that making the pizza on a piece of parchment paper and moving the dough with the paper underneath to the peel and stone is much easier and cleaner. Yes you should knead by hand as this is a great way to become familiar with the dough and how it works. You can use a dough hook of a sturdy stand mixer; however you will never understand what to look for and the feeling of well-kneaded dough. Keep practicing and kneading, I am sure you will get the hang of it. Stretch, turn, fold and repeat. Cheers! I decided to make pizza, although I never made any pastry. Never ever. Thought I would make something that will resemble a pizza, as it's my first time. Don't have pizza stone, so I used heavy bottom iron pan/skillet. Made the dough, and made pizza with some basic ingredients I had in fridge. When I took that first bite, I was left speechless. Taste and mouth-feel were f*****g unbelievable! I couldn't believe I made such great pizza from scratch. Such an eye opener. I'd kiss you all, Rouxbe team! Total resting time will be around 4 hours once I take it out of the refrigerator. Is that correct? Is the difference in flavor that noticeable when you put it in the refrigerator? Also will the dough be easier to work with if I put it in the refrigerator? Thanks Can't wait to try this. I have had some serious problems trying to make my own pizza dough. This looks simple enough. The recipe has been updated to be clearer. Once the dough has fermented in the refrigerator overnight, take it out, punch it down, portion it, cover it and let it rest until it comes to room temperature (about 2 hours). Then shape it and bake it. You might also find it useful to review the lessons on Bread Basics and The Stages of Bread Making in the Cooking School. Happy pizza making! Cheers! This is my first failure since starting the school.My dough did not rise in the refrig. last night.My yeast I bought expires jun 11,what did I do wrong?This is my first experience with yeast,it kind of scares me. First off, don't be discouraged. It may be that you just got a bad packet of yeast even though it hasn't expired yet - sometimes this happens. If you have any yeast left over, try proofing a bit of it to see how active the yeast is (see Topic 3 from the Bread Making Basics Lesson to do this). Did the dough rise at all? If your fridge is very cold, perhaps it just needs more time. What temperature was the water that you used to make the dough? If it was too hot, you may have killed the yeast. Did you also add the salt near the end of the pick-up stage? And did you knead until the dough was nice and smooth? So many cooks want everything to work out on their first try and if it does not then they often get frustrated and sometimes even give up (or blame the recipe). When in reality, any good cook has practiced these techniques dozens or even hundreds of times to become consistently good at the process, so don't give up. Make note of what you have done and try to make tweaks the next time around. Let us know how it goes. Cheers! My daughter and I made my 2nd pizza tonight and loved it. The crust was delicious and just the right consistency. We topped it with torn tomatoes (drained), mozzarella blobs, fresh basil, red onion, green bell peppers (small amts. of each) and topped it with fontina cheese grated. We got the dough kind of thin and forgot the cornmeal on the peel so had a problem getting it onto the stone in the oven, but it turned out great anyway. Earlier, my 1st pizza ever was tomato, mozzarella and fontina. For both pizzas we forgot the garlic so I'm looking forward to #3 with garlic. We're quite pleased with the efforts and looking forward to future pizzas! Any lessons on tossing pizza dough?? I've tried this many times, but I can't find the right technique. There has to be some secrets. This is not really something that we have in our pipe line, at least not at this stage but I know there are many videos on youtube about this. Cheers! Way too bad. What a great video this would make. And, it is the best way to create a great even crust without working the dough too much. I know you can find some great pizza dough tossers! A great family event. Well, something to think about. Thanks for your help. Is it possible to make the dough into pizza pies and then freeze it? Just taking it out. Putting the filling on it, and put in the oven. Fast food style. You can freeze the dough (see Step 1) but you'll need to thaw it out before you top it and bake it. I would encourage you to test the dough out both ways...make it fresh and then test out the results from frozen to see which you prefer. Sometimes the yeast can lose a bit of its leavening power and the dough is just not the same. Time savers can make a product suffer somewhat, but if you are ok with the results, it is totally up to you. Cheers! Give this dough a try. Make sure your oven and pizza stone are super hot and remember that Italians have perfected the concept of "less is more" when it comes to toppings. I often place my stone on the barbeque grates, turn the heat to high, slide the pizza on the stone, cover and cook. The high heat provides fantastic results where the dough bubbles up. Cheers! Thanks Kimberley. For a thicker dough, like the one shown in the link I mentioned, should i just adjust the streching step? Yes, you can roll it as thin or as thick as you like. Cheers! Dawn. Earlier in this thread you stated that you had broken 3 pizza stones in the last year. http://rouxbe.com/community/forums/12/topics/150?page=1#3023 You also attributed it the fact that sometimes you forget to soak the stone. This truly surprises me, for two reasons. 1. I have used a baking stone for years, to the point where it has become a gorgeous dark brown color, smooth and obviously well seasoned. I bought it from Pampered Chef, it was expensive.. but it has lasted, and I do a lot more than just bake pizza on it. 2. In all that time, I have never soaked the stone in water. I will rinse and scrape it to clean (no soap), but otherwise, it is always dry when it goes in the oven. 3. I've also never preheated the stone. Probably not a bad idea, I've just never done it. I stick whatever it is I am baking directly on a dry, room temperature stone and then into the pre-heated oven. I've never been disappointed. I have no idea what is contributing to you pizza stones cracking, but a "pizza stone" should certainly be able to withstand pizza baking temperatures! I'd look for a different brand. Pampered chef round stoneware now has handles on it.. (which I dislike) but their stoneware is great, and it is guaranteed not to crack. PS. My stoneware sits in storage right now. It is one thing I truly miss while we are away from home. um.. that would be three (3) reasons! :) Sorry! Thanks for the heads up on the pizza stone Leigh - much appreciated. I do have a new one (from William and Sonoma) so lets see how that ones goes. I have only used it once since I bought it but so far so good :-) Cheers! Hi. Can I store the dough after it has risen to use it in the next day? You can store it, but keep in mind that the yeast will eventually lose its power and the dough won't rise as nicely. Also, if the dough is kept for too long, the yeast will actually die because new food/starches are not being introduced. Bake it off and see if you don't mind the results. You'll know for next time whether or not to make less. Cheers! I used the exact measurements in this recipe and the dough was dry. When I took it out of the bowl there was about 1/8 cup of flour left at the bottom. It was dry so I added some water while kneading. I added less than 1/4 cup water but I don't know how moist the dough should be. It seems a little tough. Will it become more moist after rising? Did I do something wrong? In order to help you, did you use measuring cups/spoons to measure the ingredients or did you weigh them? What type of flour are you using? Good that you added some water to the mix.. The dough will hydrate as it rests. You might also want to check out the lessons in the Cooking School in the Bread Section. There is helpful information in these lessons that talks about ingredients and the stages of making bread/dough. Cheers! My apologies, I should have gave more info. I used King Arthur unbleached bread flour and Red Mill Semolina. I used dry measuring cups for dry ingredients and wet for wet. I did not sift the flours prior to measuring or mixing. I used 1/4 cup water to dissolve the yeast then added it to the 1 cup for a total of 1 1/4 cup water. Could it be the flours were too compact? Seems obvious I know. I took care when measuring. Yes, it is very easy to use more flour than necessary when measuring with measuring cups. Also, depending on the humidity where you are, this will also affect measuring...for the best consistency, it is worth it to have a scale if you plan on making a lot of dough or if you bake a lot. When you have a good formula for dough, scales take the guess work out. You likely used too much flour/semolina this time. Even if you do not invest in a scale, next time add only about 3/4's of the flour/semolina to the liquid components and work the dough to see the consistency you get. It is easier to add more flour to overly sticky dough than to work in water. Hope this helps and hope your pizza turns out well! Cheers! Hi. I can't find bread flour in my area. If I need to use all purpose flour, should I increase the amount of flour to add more gluten to the recipe? I found a "gluten flour"; can I use it to achive the expected amount of gluten? Thanks in advance. I've been making grilled pizza this summer and they have been delicious and fun. I add finely chopped fresh herbs from my garden - basil and rosemary - to the dough which give it a pretty green speckled look and, of course, a lot of extra flavor. You can substitute the same amount of all-purpose flour for bread flour here. The dough just won't be as chewy. If you are talking about a product such as vital, you can definitely add some in to the dough as per the manufacturer's instructions...but try out the all-purpose flour first and see if you like the results. Cheers! I just ran across this blog and saw the issue of the pizza stone cracking. I have never had a problem with my stone cracking and I have had it for years. It was bought at a discount store, too. The instructions were simple, though. Place the stone in a cold oven and preheat the oven. It is the sudden temperatures that will crack the stone. When you place your pizza on the stone, the heat of the stone will assist browning of the crust. That's the whole reasoning for using the stone. When the pizza comes out, I let the stone cool in the oven. I remove it when it is cool. My stone is a beautiful brown color and is well seasoned. I never wash it. I simply scrape it and brush it off. For some reason I think I might just be cursed when it comes to pizza stones :-) I say this because I do everything that you say, yet I have still had 3 crack on me. My current stone I have had for a bit now so we'll see how that goes. Cheers! Obviously some varying opinions, so I went straight to Pampered Chef and got their recommendations which I have reprinted here. Note that they recommend to NOT preheat the stone. I also suspect that soaking your stone prior to using contributed to your cracking, as all that moisture would cause uneven heating.. Stoneware Use and Care * Hand wash only; wash prior to first use. Remove excess food with scraper. It is not recommended to use soap, detergent or an automatic dishwasher. Not dishwasher-safe. * Stoneware will naturally season and develop a natural nonstick surface over time with use. * Slight sticking may occur for the first several uses. For best results, bake high-fat foods (e.g., refrigerated biscuits) or lightly brush with cooking oil for the first several uses. Aerosol nonstick spray is not recommended; it will create a sticky residue which is difficult to clean. * Stoneware can be used in conventional, convection and microwave ovens, and is freezer safe. Stoneware is heat-resistant to 450°F (230°C). Do not use Stoneware under broiler or on direct heat source. Follow oven manufacturer's guidelines. Tips * Prevent breakage from thermal shock by avoiding extreme temperature changes. * Do not preheat stone. * At least two-thirds of Stoneware surface should be covered with food to avoid thermal shock. Always evenly distribute food over Stoneware surface; avoid clustering foods. * Do not place dense, frozen food items (chicken breasts, pot pies, roasts or chops) on Stoneware. Always thaw dense, frozen food in refrigerator prior to baking. * Foods refrigerated in Stoneware may be placed directly in a preheated oven. * Do not place any other pan or rack on top of Stoneware while baking. * Follow recipe temperature and baking time when using Stoneware. Short bake times (under 12 minutes) may need an additional 1-2 minutes. Safeguards * Hot Stoneware can cause burns if handled improperly. Always use a heat-resistant oven mitt or pad when handling hot Stoneware or placing on surfaces. * Stoneware may scratch surfaces if moved or dragged. To protect surfaces, use protective barrier between Stoneware and surface. * Avoid extreme temperature changes. Always allow Stoneware to cool to room temperature prior to adding liquid or cleaning. Do not use chipped or damaged Stoneware. * Stoneware can break if bumped or dropped. If this occurs, use caution as broken pieces can be sharp and could cause injury. * Stoneware should not touch sides of oven or oven door when closed. Funny, but mine said to put it in a cold oven and turn the oven on. They said to put it in a hot oven would cause it to crack. I've followed that instruction and have never had a problem. Of course, I didn't spend what you must have to buy my stone, since you bought from Pampered Chef. I guess the advice is to follow the manufacturer's instructions on the use of your stone. I had a couple of questions. What does the semolina do? How can I tell whether the flour is bleached? In the uk supermarkets, it doesn't seem to say and usually the only listed ingredients are wheat flour! I couldnt find semolina flour anywhere so just added more bread flour (12.8% protein). may have used too much as I felt the pizza was more like the type you get in frozen pizzas (hard round the edges and a bit too bready in the middle). Would a pizza stone get rid of the hard edges ? Semolina gives the dough a very slight grainy texture. Here in North America, our wheat flour is labeled as bleached or unbleached. If your flour is bleached, it will likely have other ingredients listed. It is fine if you used all bread flour; however, it is best to weigh the ingredients to obtain the proper ratio/texture. Not exactly sure what you mean by a pizza stone getting rid of the hard edges. Did you use a stone to cook the pizza? Cooking on a hot stone will promote even cooking and will cook the dough quickly...making it bubble up and become nice and crispy. Give it another try making these small tweaks. Hope this helps! If you are using bread flour, I don't think it is the flour. 15 to 20 minutes sounds a bit long to develop a smooth texture. Olive oil/fat helps to soften the dough so it's not that. When kneading, make sure to use quite a bit of downward pressure. Press and stretch the dough into the counter and remember to give it a quarter turn and fold it over itself every time. Don't worry about being a bit aggressive. It's a great way to work out any stresses :-) Try it again and let us know how it goes. Cheers! Regarding the pizza stone, did you place it into the center of a cold oven and then preheat it? The stone will turn color and stain, especially after items have been baked on it. Perhaps there was some leftover debris from the last time you used it that was burning off? Try it again and see if the same thing happens. From my understanding, pizza stones are supposed to withstand high heat of at least 450F. I have never had to soak my pizza stone. I actually use mine on the BBQ to cook pizza and the heat is much hotter than that. The results are fantastic and I haven't had the stone break on me yet. The hotter the stone, the quicker the pizza will cook. This is why good pizza shops have wood burning ovens. Their pizzas cook pizzas in just a few minutes (and those ovens are way hotter than 500F). Make sure you scrape any bits of dough/food off of the stone once you are finished cooking with it and it is cool enough to handle. Aside from placing the stone into a cold oven and then turning on the heat to slowly heat it, I can't think of anything else to suggest. Give it another try and let us know how it goes. Cheers! No problem. Just to be clear, you only need to put the stone into the cold oven and then set the temperature to 450F. It will slowly heat up as the oven heats up. It's best not to put a cold stone into a hot oven; otherwise, it may crack. Cheers! In the text recipe (see step 1), the instructions are given for letting dough ferment/rise overnight in the refrigerator. The slow rise helps to develop more flavor in the dough. It is best to make the dough one day, refrigerate it overnight and then use it the next day. If you leave the dough for too long in the refrigerator, the yeast can lose its power. You might also find it helpful to review the lesson on the Stages of Bread Making in the Cooking School. Here we cover fermenting/rising steps. Cheers! I have read that the active dry yeast requires a double rise, and the instant does not. The basic dough recipe uses instant dough and I would prefer to use active, but wonder whether a second rise is needed. Also, do you have any comments on what the double rise refers to? I seem to recall "punching down the dough" in previous times. Thanks for any insight here. The primary difference between instant yeast and active dry is that they need to be handled differently when combining the ingredients (instant does not need to be dissolved - see topic on Yeast in the lesson on the Basics of Bread Making). You can definitely substitute active dry yeast for instant in any formula. Some yeast breads - whether they are made with instant or active dry yeast - can go through a double rise. The extended fermenting process will help to develop more flavor. Punching the dough down again before the shaping stage will also help redistribute the yeast once again, build flavor and help to produce a finer texture/crumb in the finished product. Most yeast doughs go through similar stages though: fermenting - punching down/portioning/pre-shaping/shaping/proofing and finally baking. It all depends on the product and how much time the you have. Again, make sure to check out all of the lessons in the Bread section. Cheers! I have had great success with this recipe, So I had frozen some of the dough, When I went to use it, I must of done something wrong when I thawed it and it stuck to my pizza peel...... So I folded it over and called it a Stromboli instead, It was fantastic! Hello, How long is too long in the refrigerator ? Can I keep it there for 3 or 4 days ? &amp; Can I bake just the dough for later use? I am trying to figure out how to make a lot of pizzas in a short amount of time(feeding a large crowd). Thanks for the help! 3 to 4 days is too long. The yeast will run out of food and die and you won't get a good rise (if any) when you go to bake. My preference is to make the dough the day before as shown in the video, but if you have to, you can make the dough ahead of time and freeze it (also shown). If you freeze the pizza dough, just let it thaw overnight in the refrigerator. Whether you freeze the dough or just refrigerate it, let it come to room temperature before you try to shape it. The results are good...but not as good when it is made fresh. Mise en place is key. Have everything grated, sliced, prepped and making the dough the day before will be easy. Cheers! As per Step 1 of the recipe "Remove the dough from the refrigerator about 2 hours prior to making pizza so the dough can come to room temperature." Hope this helps. Cheers! I made the pizza dough yesterday and planned on using all of it. A few hours later I decided to use the rest of it the next day (today) so I put it in the fridge. I took it out today and its flat and doesn't smell pleasant. Kind of bitter too and sour. Is it still okay to use today? I'm assuming after you made the dough yesterday that you formed it into rounds and let it rise on the counter. If you transferred it directly to the refrigerator, ideally, it should have been punched down again, placed into a bowl and covered with plastic wrap to rest over night. It may be flat because it was not punched down or shaped into a round; also, the yeast could be a bit less powerful now. There shouldn't be anything wrong (spoiled) with the dough, providing you didn't leave it out for hours and hours before transferring it to the refrigerator. You can test it by baking off a small piece. If it doesn't rise at all or if you don't like the flavor, you'll know not to proceed any further and cover the dough with a bunch of expensive ingredients. As yeast dough ages, it develops a yeasty smell, which also means more flavor. If you haven't already done so, please check out the lessons in the Bread section of the Cooking School on How to Make Bread Basics and The Stages of Bread Making. This will help to give you a clearer picture on the stages that yeast dough goes through. Cheers! Hi, I haven't tried this yet but am going to tomorrow, I think. As soon as I buy the pizza stone! So...my question is: can I just use the two types of flours (well, cornmeal isn't really flour, I guess) I have in my cupboard already? I have cornmeal and regular AP flour. Can I substitute the amounts given in the recipe directly? Instead of the semolina flour and bread flour? I plan to do it "properly" in a few weeks for a crowd but I just want to do a test run or two with what I already have at home. Would this work? 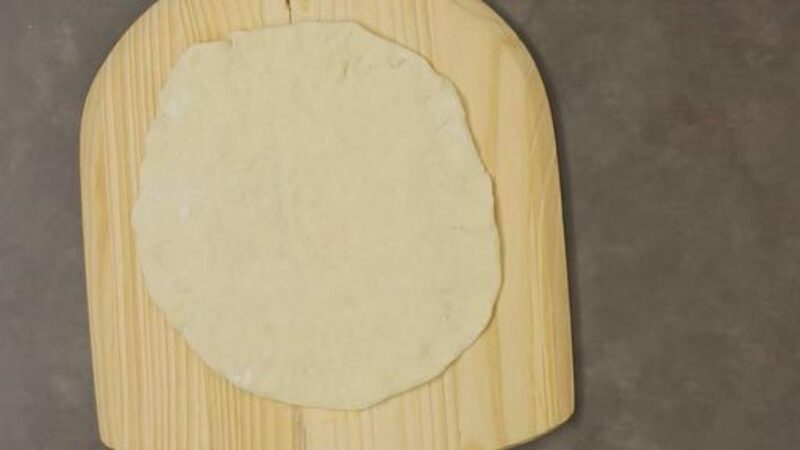 Also, I may have missed this somewhere but if you don't have a peel, you slide the pizza on parchment paper from the back of the baking tray you assemble it on, on to the pre-heated stone keeping the parchment underneath? Sorry, I should try first, then ask but I just wanted to pre-ask first! :) I want to avoid all disasters if possible! No, do not substitute cornmeal for the semolina. Just use all all-purpose flour and use the cornmeal to sprinkle onto the peel. In the notes section of this recipe, there is a link to Pizza 4 Ways, which shows you how to assemble and bake a variety of pizzas. Usually stones come with a peel. If you don't buy one, it is probably better to sprinkle the back of a baking sheet with the cornmeal and assemble the pizza on that so you can slide it onto the stone. Parchment will be too flexible and it's likely that your pizza won't wind up on the stone and that would be a sad disaster :-( Cheers! Good for you for making notes and understanding where you might have gone wrong. This is how we all improve our cooking. I am sure that the next attempt will be much better. Keep up the good work Gail. Cheers! Sorry for excessive posting but finished now. Practice makes pretty much perfect and the moral of the story is...if Rouxbe says use bread flour and semolina flour- USE THEM. I made an almost perfect (still need to invest in peel) margarita pizza and am very happy with the result. Thank you again. Yeah, so happy to hear...keep practicing and you will be a pizza pro in no time :-) Cheers! When I read the question from the lady who makes her own mozzarella she asked could she use the Whey left instead of plain water. In your response to her question you indicated she could use the whey or milk instead of the plain water. So my question would be could I use whole milk not reduced fat instead of the water listed in the recipe? I can't wait to try this recipe and hopefully can brag about how great my totally homemade pizza was. Thanks for all your time and help with guiding all of us along on our journey to being better cooks. I have not tried it personnaly but I am sure it works to some degree. Again it may brown faster or too fast...definitely worth trying it. Let us know if you notice a difference. Thanks Christophe for your answer. I went ahead and made my first bread per video instrudtions yesterday and was very pleased with my first try. I didn't use the milk as I didn't have the answer yet but will give it a go next time and will let you know. Also does the person who was describing how to make the starter for sour dough have the amount of water to flour ratio for each batch as in the first batch then the next days batch after throwing away half of the mixture. I wasn't quite sure how much of each water and flour for the first mixture and so on. I would love to give it a go. Thanks again for the info about milk. Plastic bowls are something we generally avoid. First, because we do not like the feel of them. And secondly, because they scratch and are often not as clean as they should be. Having said that, I asked around and nobody seems to think that they would have a negative effect on dough making or process. In regards to prooffing in the fridge, what it does is, it slows down the proofing process and allows the bread to develops a bit more tanginess/flavor. Cheers! I'm not sure if I didn't knead the dough properly, it is the fact that I only left it to rest for an hour only but I had a tough time shaping it. It would not stretch properly it was a bit tough and had to use a roller to flatten it. Not sure what I did wrong it was delicious though. I made a new batch for tomorrow leaving this in the fridge overnight. Did the kneading for 10-20 mins not sure wasnt keeping track of time. The dough was still a little bit stick. I have had the same problem with my dough having too much elasticity. I just did a few experiments and think I have discovered some ways to modify the dough's elasticity. I've been modifying the recipe's ingredients and found that when I omit the olive oil, it becomes tougher to stretch out. The olive oil seems to make the dough much easier to work with. After some research, it makes sense because the oil reduces the effects of the gluten, which in another experiment, I found adding gluten to my flour makes for a very hard and unworkable dough. My test subjects agreed that the olive oil dough was much tastier. Two wins there. I also tried a few batches without kneading the dough. I just mixed it up and put it in the fridge for 1-2 days to develop. It seemed softer and easier to work with then kneaded dough, but didn't seem to look any different than the kneaded dough. It produced a nice chewy crust like the kneaded dough. As far as stickiness, I make my dough a little more on the sticky side and then just flour my board and hands to work with it. I've always had to adjust the hydration of my bread doughs because I live at a higher altitude and in a desert; winters are especially dry. More hydration also makes for a softer dough. I try to let it stay as wet as I can because I notice it creates a more open crust (bubbles) kind of like a ciabatta, which I like in my crust. I used to have difficulty getting it into the oven until I started using parchment paper under it. I now have no problem transferring it to my stone in the oven. I take a 14 inch square piece of parchment, fold and cut it (like those paper snowflakes) to make a round paper just the right size for a large pizza. It doesn't seem to interfere with the cooking process on the stone either. Thanks for the tips Daniel, will try to add a bit more olive oil next time. Should I add a little bit more water? I used a blend of unbleached all purpose flour and wheat bran...cooked up some mild Italian sausage and put them on with peppers and what a different taste...I've been using this flour for buns or bread but it gives the pizza another level of taste. A very easy recipe to make and will be making it more often now. I love these courses and I'm always learning something new...Thanks Rouxbe!! how long should I soak my pizza stone Dawn? Just ignore my question Dawn, I read Leigh's comment and your response to it. Pardon my impatience, thanks anyway. I feel I am stoned with those stony exchanges of experiences about the pizza stone. I will just stick to the instruction from the video on baking steps then as I did the first time I let the stone cool in my oven, scrape the mess afterwards then use it again as instructed in the video lesson. If my stone cracks its ok, as long as my head and my sanity doesn't. A long but well grounded response, pardon my brief but sincerest thank you. Just a heads up that in the recipe it calls for 3 1/4 cups of bread flour, although in brackets is says 400 g. I actually added all this flour before I realised. Doh! Yeah I know. 400g is 3 and 1/4 cups. But I did find using the cup measurements for this recipe, the dough was not sticky at all. In any event my dough did not rise well and I'm not sure why. Still delicious though. There could be several reasons why the dough did not rise well. Perhaps the yeast you used was dead, too hot etc. It could also be that your measurements were off a bit. Weighing ingredients when it comes to things like making dough is generally much more accurate and consistent then using measuring cups or measuring spoons. I would suggest that you try it again and the next time perhaps start by using a bit less flour (if you are not using a scale) and then add more if needed. Hope that helps. Cheers! I have been struggling with making a great pizza for a long time. I have tried several dough recipes and store bought nothing was ever great. Always too thick and either over dense or too bready. I had even tried this dough recipe and was unable to get the desired number of toppings on a super thin crust to transfer to the stone without tearing or getting totally messed up. I finally tried parchment and it worked perfectly. I was able to cut it to fit my stone and roll the dough out on the parchment and then place toppings. Transferring to the stone from a peel with the parchment underneath was very easy and I avoided the cornmeal bits all over my oven floor. It came out totally fantastic. Plus you can construct another pizza on parchment while the first is cooking without needing an extra peel. I don't know... obviously this worked for you, but somehow it seems like having a layer of parchment between the pizza and the stone would sort of defeat the purpose of the stone. I find it surprising that it worked. Was your crust nice and crisp and toasty? Yes it came out very nice and crispy and golden. I'm not sure that parchment is thick enough to insulate much when used in conjunction with such a high heat source and stone. I guess it could be removed after the crust sets. Someone correct me if I'm wrong but the stone is acting as a stable source of conductive heat to rapidly heat / cook the crust. So I'm not sure that the surface interaction is really necessary as long as it doesn't introduce some detrimental effect (I'm thinking along the lines of moisture collection which could make the crust soggy). In fact isn't the pizza supposed to sit on a cushion of cornmeal when used in the traditional manner? I'd be interested to hear of others have tried parchment with success (or failure). In the video your dough rises quite a lot. If mine does not rise and fill the bowl is that a sign of bad yeast or...? Thanks for the comments Dawn. I will keep plugging away and try some different variations. "... could I bake pizza off in this placed directly on a pizza stone" My short answer is "probably, but why would you?" Either just use the perforated pizza tray directly on a rack, or put your pizza dough directly on the stone (with some corn meal to act like ball-bearings) I have used the latter method for years and each use only makes my stone better! I'd also be a little concerned about having a metal tray directly on the stone as the variances in heat between the stone and the metal could cause it the stone to crack. LOL. Good pointers. I suppose I will try each method independently. and compare results. Oh my! Growing up in an Italian household, my dad always had me make the pizza dough cuz he said I made the best... but THIS, I would have never thought of adding the semolina flour!! I cannot wait to try this out! And yes, definitely less is more. And we actually like "white pizza's" around here :) ..... going to try out some white bean sauces to put on top too. Thanks you guys... I am so LOVING this site! I have kneaded the dough and portioned into 2 rounds as per video. I have it in the fridge to ferment overnight. My question is in order to make a large pie (pizzeria size) . what portion size should I be using tomorrow when ready to shape? This does help. Looking forward to baking this.Thank you Ken. I am planning to make this and I am planning to use my cast iron griddle in lieu of a pizza stone. Are the temperature (450 degrees) and times (30 minutes) the same or different? The temperature and times are really just estimates, whether using a pizza stone or a cast iron griddle. Ideally the oven should be as hot as possible. Pizzerias cook their pizzas in 900* ovens. As for how long it will take to pre-heat a cast iron skillet, it will likely be around that time, but again, it's sort of just an estimation. The one thing that will likely vary, is the time it will take for the cast iron griddle to cool down. Cast iron tends to maintain and retain heat quite well, so it will stay hot for quite a while. Hope that helps Geni. Cheers! The video says to knead the dough for 5 to 7 minutes, or until soft, but really you can go even longer then that if you like — just know that it is really hard to over knead dough, so don't be afraid to knead it well. You should be able to feel the difference from when you first start — it will be rougher and harder, and then afterwards it will be softer and more pliable. This is where practicing and becoming more comfortable with the dough will really help. You may also want to review the video again — if you haven't already. Hope that helps. Cheers! I am presently shopping for a food processor. I would like to know if the kneading attachment would be useful for kneading: 1)	Pizza dough 2)	Laminated pasta dough 3)	Bread ..
Around here, I really do not have much choice when it comes to flour (they offer unbleached all-purpose white flour, self-rising white flour and whole-grain wheat flour; all the rest comes in pre-made cookie/brownie/muffin/cake/bread/pizza dough boxes - the Dutch don't seem to be very fond of making their breads/pastries from scratch). Anyway, after doing some research, I realized that *semolina flour* might actually be finely ground *wheat grits* or *wheat groats* (weizengrieß in German), which I have at home for making porridges anyway. So I simply filled up my coffee grinder with the coarse wheat grits and ground it up to a preferred consistency (something comparable to the flour used in Rouxbe video and whatever photo material google search had to offer on the topic), then measured it according to the recipe. It worked like a charm! The only tricky thing is sharing this secret ingredient with the curious Dutch asking for the recipe during dinner parties, heh ;). I think you should spend more time talking about transferring the pizza to the stone in the oven. I have had two recent misfortunes in this area. I have used copious amounts of corn meal, but the pizza still wants to stick to the peel. By the way, using all that corn meal leaves the oven in a mess with all the blackened corn meal granuals dropping to the bottom. The first time I tried it with a wood peel and managed to get it into the oven but, because of the blunt edge on the peel, getting it out trashed the pizza. I then bought an aluminum peel and even sharpened the edge with a grinder. it took a lot of finese to get it under the stretched out dough. I then built the pizza and when it came time to slide it on the stone, the damn thing would not leave the peel. instead all the toppings came off and i now have an oven cleaning job ahead of me when I should be enjoying a great pizza. Before I buy a larger wooden peel, which will make me the proud owner of 3 peels, do you have any suggestions? My suggestion is to practice by cooking basic flat breads so there is no risk of toppings ruining the oven and causing a mess. Get the dough so it's not to thin, that makes it more likely to stretch (and not slide). I tell people that it's often a battle NOT worth fighting - to try to make a perfect full-size round pizza on a home oven sized pizza stone. Any small error or miscalculation is a disaster. It's way easier to manage and handle 2 smaller pizzas and the results are often better anyway. Also, try semolina instead of corn meal - some find it easier to work with. Now THAT discovery is worth a few ruined pizzas! Thanks for the informative and encouraging follow-up. Thanks for your note Leigh. As a footnote, I made friends with the manager of one of the best pizza joints in my area. They have been around for years. They do a super job on pizzas and have a nice thin crust, which I prefer. My new friend confided that they use wood rollers all the time to spread out their dough quickly and that for $4.00 each he would sell me enough room temperature ready to go dough balls to make 16" pizzas. I tried one the other day and it is a great solution if you are in a hurry and have to make a bunch of pizzas for the weekend football crowd. I've made many gluten full and gluten free pizza doughs recently. Some with baking soda or yeast or xantha gum and/or with psyllium husk. Does Rouxbe, or any of the members here have a successful dough recipe that would mimic the real flour one described here? Help!!!! I made my dough about 5:30 last night. Put it in the fridge and had tea then about 8 I went to bed. Got up this morning and when I looked at my dough It had hardly reason. I couldn't believe my eyes. Then I watched Rouxbe video on gluten and I realized that I didn't knead it enough. So what I did is I took it out of the fridge and am leaving it there until its workable. (my dad says it looks like snail though it is white). Please answer me real quick cause I promised my folks that I would cook them pizza tonight!!!!!!!!! Angela, sorry that no one has noticed your plea for help yet, and it is obvious that my response is much too late... I hope things worked out for you, or did you end up calling Domino's? All I can offer is some advice for next time: 1. The dough will not rise much in the fridge. You can safely leave it overnight like you did, but you do want to remove it from the fridge and allow it to sit at room temperature for about 3 hours before using it. (Allow it to double in size once it is back to room temperature) 2. Once risen, punch it down (which always seems like a weird thing to do to me - but it is all part of the gluten development) and begin to shape your dough. 3. If your dough doesn't want to hold it's shape, leave it flattened and let it rest (covered with plastic wrap) which will allow the gluten fibres to relax. You will find the dough much easier to work once it has rested. 4. Don't give up.. try again next week. The fact that the dough looked and felt smooth is a pretty good indication that you did things right! Sorry that no one has responded to your plea for help yet, and I am sure the moment of need has passed by now, but maybe for next time. One possibility is that your yeast was dead. Easy enough to check. Just add a tsp to some warm water and a little sugar. Give it 10 minutes and it should foam up and look "alive". The main thing is, don't give up. Try again, and see if you can determine what went wrong. Experience (both good and bad) is your best source of learning... especially when making dough! Hi Leigh No I didn't ring Domino's!! The pizza turned out all right in the end. Thanks for your reply I'll keep that in mind next time. That's a good tip. I made pizza dough using a mixer for the first time. While messy, my handmade ones turned out better. I think just throwing in the yeast with the flour was a mistake. Good afternoon! Would applesauce or chia seed slurry work as an acceptable replacement for the oil for this pizza dough recipe? I want to make homemade vegan pizza snack for a family member who has to remove oil from their diet. Thanks Leigh and Ken. Omission worked. I made a couple of other adjustments to make it a whole-grain dough and it was a great success!